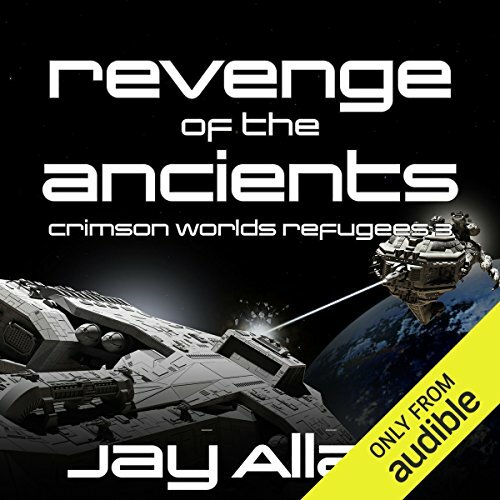 The Stunning Conclusion to Jay Allan's Crimson Worlds Refugees Trilogy! A battered group of human ships, fighting for survival, fleeing deeper into the far unknown, pursued by the deadly forces of the genocidal artificial intelligence known as the Regent. A legendary commander, the man who has saved his people time and time again, struggling to lead the fleet ever forward, fighting through every attack the enemy throws at them. A hidden world, a remote refuge prepared millennia ago, holding the promise of a new future - if the fleet can reach it and hold it against the Regent's relentless attacks. Admiral Terrance Compton and his lost fleet battle their way forward, striving to reach the end of their great journey. They will fight with all the strength and power that remains in them, standing firm, resolute against all the force the Regent hurls at them. But their destiny is no longer in their hands. In the end the fleet's survival rests on the courage and strength of a tiny force of marines and a desperate mission - one that will lead this group of warriors right through the enemy's thickest defenses, to the very heart of the enemy's domains, the ancient home world of the First Imperium...and the inner sanctum of the Regent itself. The action-packed conclusion to the Crimson Worlds Refugees series! Few! Finally finished. Yes I enjoyed. I did find myself dreading any battle since the same phrases and concepts were simply trotted-out every. single. time -- and for a series with lots of battles, that was really often. It's nice to never know if one or many of the main characters will make it and it takes a strong storyteller to make it happen while keeping the reader engaged. This is a hard yet thrilling book to read with every manner of heroics and sacrifice every space drama requires. Again as with the other books, he repeatedly repeats as if just to use the extra words as a filler. It's probably the most frustrated I've been with a author who otherwise writes a great story. I find my self pulled from the story hoping he'll quickly finish the rambling so the story can continue. Revenge of the Ancients is a satisfying conclusion to the Crimson Worlds Refugees trilogy. With the main fleet headed to Shangra-lai. Admiral Compton leads a rear guard effort to mislead the Regent's forces running a nonstop gauntlet of enemy vessels. In spite of the feint, the Regent discovers the hidden world and presses the attack. At the same time, a scout ship sent in search of the final secret human settlement finds nothing but another trap.With things looking pretty hopeless, Cutter with the aid of the ancient technology develops a weapon powerful enough to take down the Regent, but requires a stealth mission to succeed. The sci-fi elements are in line with earlier installments. Much of the time is spent in battle after battle with humanity's only trick up their sleeve, their unpredictability in battle strategy. The battle scenes are well executed and rendered in exquisite detail. There is much bravery and many of the prominent characters are killed off. The question of whether the refugees can ever get back to Earth is left unresolved. The narration is well done with a solid range of voices of both genders. Pacing follows the intensity of the fighting and the introspective musings of men and women knowing it can all end at any moment. what a wild ride of emotions during the reading and listening of this audio book. I take it by the ending that there will be a book 4 down the road. The story was predictable and repetitive with moments of interest. Narrator was good. I would not recommend this story to a friend. the book really does a great job at telling a story in phases. I can't wait for the next series to see what comes out with this next book. I really enjoyed all 3 books. highly recommend. if you enjoy scifi books, you'll like this series.